On Tuesday, April 4, members of Chicago's film community, charity leaders and Chicago figures gathered outside of the Chicago Theatre to honor the late film critic Roger Ebert, who passed away on April 4, 2013. It was in that same spot outside of the Chicago theatre that Ebert delivered his famous quote about movies functioning as machines that generate empathy. 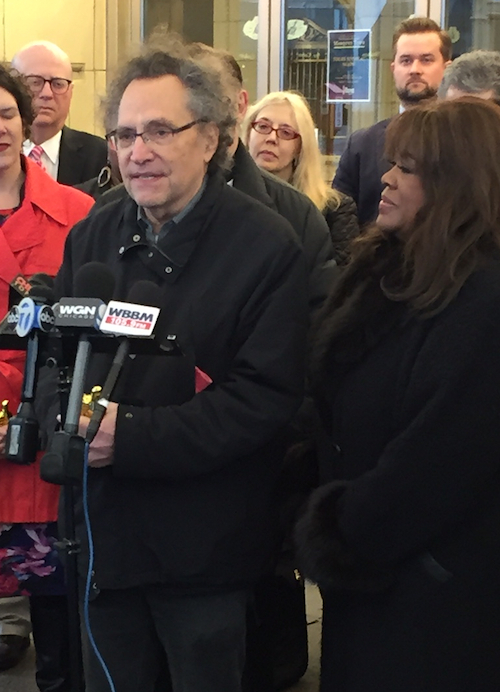 Both Kartemquin Artistic Director and co-founder Gordon Quinn and director Steve James (director of the 2014 Life Itself) spoke as tribute to Ebert. Kartemquin was honored to receive one of 21 $1,000 grants awarded by the Ebert Foundation to organizations that are working to improve the lives of Chicagoans and advance the arts. Other special guests included Marlene Iglitzen, widow of Gene Siskel; Father Michael Pfleger of St. Sabina Church; Michael Kutza, founder of the Chicago International Film Festival; Richard Roeper, Chicago Sun-Times chief film critic; Michael Phillips, Chicago Tribune chief film critic; Steve Cohen and Paula Froehle, co-founders of the Chicago Media Project; Nicole Bernardi-Reis, executive director, Independent Film Project Chicago; Dann Gire, board president, Chicago Film Critics Association; Rich Moskal, director of the Chicago Film Office; and Christine Dudley, director of the Illinois Film Office.